Campi Flegrei caldera is an active volcanic area marked by a quasi-circular caldera depression, formed by huge ignimbritic eruptions. 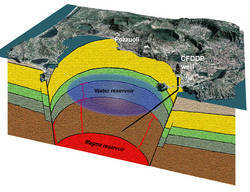 The caldera has recently experienced intense deformation, originating uplift phenomena of more than 3.5 m in 15 years, with maximum rates of 1 m/year in the period 1982-1984, which caused the temporary evacuation of 30,000 people from the centre of Pozzuoli and exposed more than 500,000 the risk of pyroclastic flows (several millions in case of an ignimbritic eruption). The role of deep drilling at this area is then crucial. It will give a fundamental, precise insight into the shallow substructure, the geometry and character of the geothermal systems and their role in the unrest episodes, as well as to explain magma chemistry and the mechanisms of magma-water interaction.